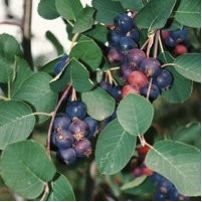 The Saskatoon berry, also known as the Serviceberry, Juneberry, and Shadbush, is a wild plant native to Western Canada. Saskatoon berries grow in Canada from the Great Plains to the British Columbia coast. The berries are especially well known and productive in the BC Southern Interior and the Alberta foothills. The name Saskatoon originates from the First Nations Cree noun misâskwatômina. The berries grow on a deciduous shrub, 1-3 meters tall, with clusters of white flowers that bloom from April to June. The fruits are medium-sized, fleshy dark bluish, and are generally sweet and juicy. The berries have a sweet, earthy flavor with a rich almond/marzipan undertone due to the flavor of the seeds. They are rich in iron and vitamin C with antioxidant properties comparable to blueberries. Indigenous peoples traditionally used Saskatoons as a major food source, pounding the berries into a thick paste that was spread on mats to slowly dry into a form that could be stored over the winter. This paste was eaten plain and also mixed into stews or with bear fat or eulichan grease. Wild Saskatoon berries are under serious threat in Western Canada due to loss of habitat caused by housing and industrial development. As the plants are lost, so is the historical knowledge and practice of gathering the berries carried out for generations by First Nations people. Protecting the wild Saskatoon berry is important not only for the continued existence of the plant itself but also, perhaps more importantly, for the continued existence of the historical knowledge and practices associated with the gathering of this wild food. Located at the corner of Doug Duncan and Timothy St.
Town Park on Wells St between Mosley St. & Metcalfe St.
From Okotoks, going north on 2A, turn east at the top of the hill (large animal clinic or watch for our neon sign) and travel 8km straight east (passing over #2 highway). The road will lead you right to us, follow the signs. We are located on Highway 7, two miles west of Acton, on the south side. From the 401, take Highway 25 north and go west on Highway 7 to Crewsons Line. We are on the south west corner of Highway 7 and Crewsons Line. I work for TreeTime.ca and I was wondering if you could update our name, link and description please. Hi Blaine – very sorry for the delay. This update has been completed.